I have ten cards of Mike Armstrong. 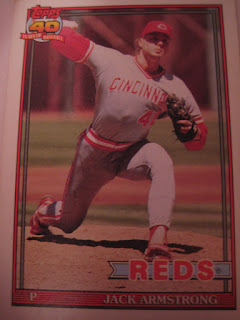 This one is from 1985 Donruss. Playing career: Mike Armstrong pitched for the Padres, Royals, Yankees and Indians from 1980 to 1987, winning 19 games and saving 11. My memories: Don’t remember his playing career, but I remembered him from a famous quote where the Royals manager calls the bullpen and asks the bullpen coach of the two pitchers warming up, Mike Armstrong and Bill Castro, “Which one looks better?” to which the coach replied, “They’re both ugly.” When looking up the quote to make sure Armstrong was one of the pitchers I came across this great old SportsIllustrated article written by the late Dan Quisenberry comparing bullpens across the major leagues. I miss fun behind-the-scenes writing by baseball players like you used to see a lot of in the 1980s. Are there any funny active players today like Quisenberry was a generation ago? Where he is now: He is a retired construction worker who as of 2006 was still pitching in a wooden bat league in Georgia. Google Autocomplete results: He is third when you type Mike Ar, between Mike Arrington, founder of the blog TechCrunch, and Mike Arteaga’s Fitness, a gym chain in upstate New York. The baseball player is fourth when you google Mike Armstrong, with the preceding results for a comedian and a Washington state legislator. Coming up next: The next profile will be Larry Arndt. 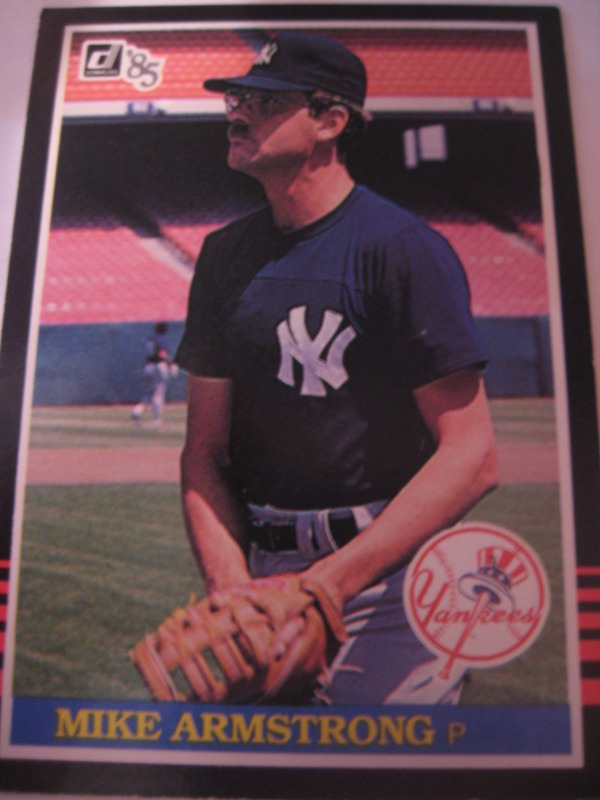 Thanks in advance to TribeDad who told me yesterday he will send me the Lance Parrish card I need to finish my 1993 Topps set. Also yesterday I went to a garage sale and picked up a bunch of cards. Here are a couple that showcase Parrish's consistent form in applying a tag at home plate. Got a bunch of cards in a trade with Thorzul. The best card in the bunch was this 1993 Topps card, featuring a Dodger who would hit over 200 HR as a Met, a Blue Jay who would hit over 100 HR as a Met, a Met who played four games for them and over 600 for other teams, and a Yankee who never made it to the majors. 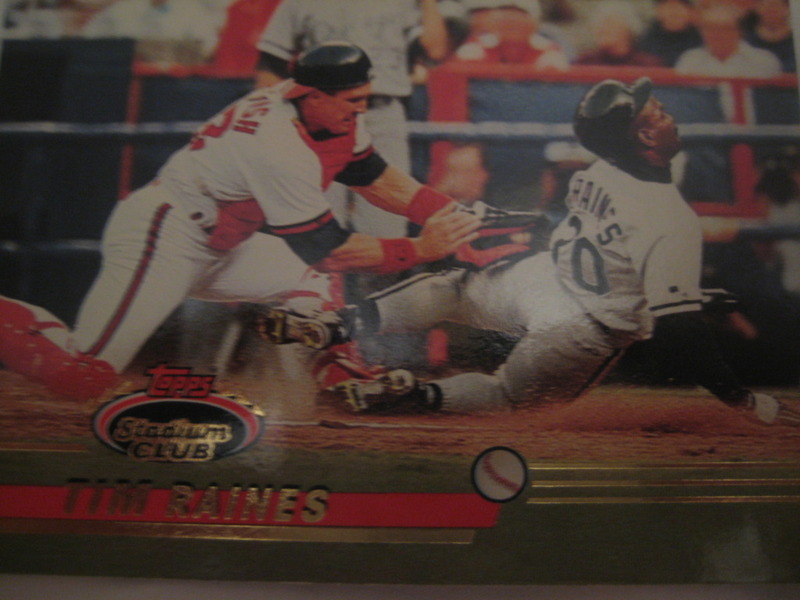 This leaves me just one card shy of completing the 1993 Topps set. 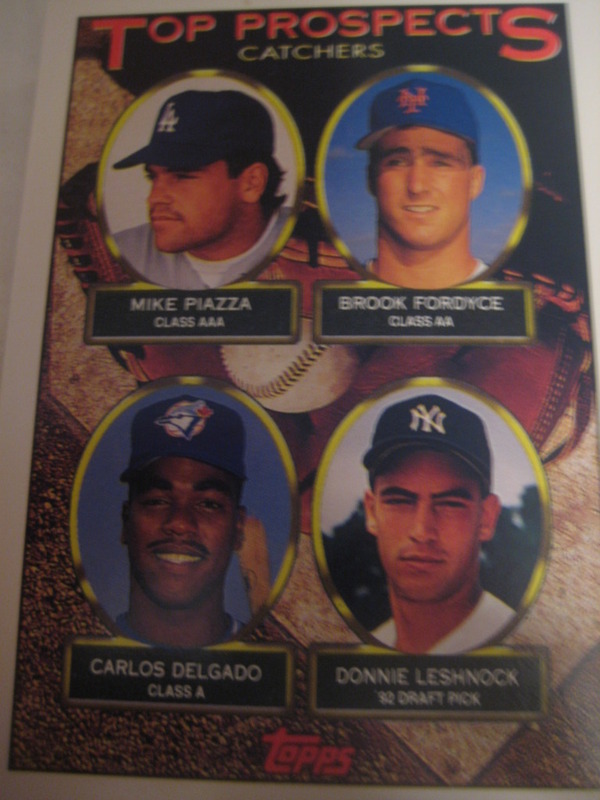 I have the Piazza rookie, I have the Jeter rookie (had it since '93), have Griffey, Ryan, all the big stars. 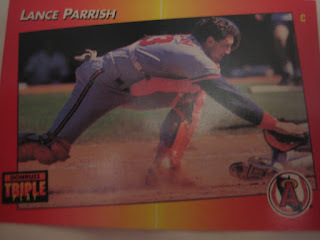 The one thats eluded me: Lance Parrish, #609. Any of you out there have it? Check out the latest This Week in Baseball Cards at the Hall of Very Good! I have 50 cards of Jack Armstrong. 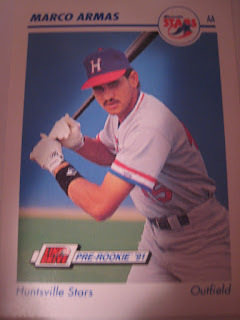 This one is from 1991 Topps. Playing career: Jack Armstrong came up with the Reds in 1988 and looked like a star in the making in 1990, starting the season 11-3 and starting the All Star Game. However, he won only one more game the rest of the season, pitched just three innings of relief in the postseason, and went 22-45 for four teams over the next four years. My memories: I had remembered him as a minor star, I guess because of the All Star Game start. I didn’t realize he was actually a pretty lousy major league pitcher. Interesting facts: His son Jack Armstrong Jr. was drafted and signed by the Astros in 2011. Jack Sr. went to Neptune High School in New Jersey; Jack Jr. went to Jupiter High School in Florida. Presumably if there is a Jack III he will go to Mars High School in Pennsylvania. Where he is now: He’s a personal trainer and pitching instructor in Florida. He blames his lousy pitching record on steroid-usingbatters, despite admitting to never seeing any actual juicing by players, and not explaining how other pitchers managed to actually win games against the same lineups. Google Autocomplete results: He is third when you type Jack Ar, between Jack Arute, a football reporter for Sirius XM radio, and Jack Arnold House Plans, referring to a luxury house designer in Tulsa, OK. Another prominent Jack Armstrong is Jack Armstrong, the All-American Boy, a radio drama from the 1930s. I have one card of Ed Armbrister, from 1978 Topps. 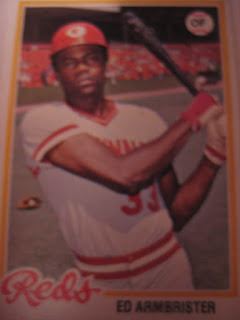 Playing career: The last living Bahamian major leaguer, outfielder Ed Armbrister played for the Reds from 1973 to 1977, hitting .245 with 4 HR and 19 RBI in 224 games. Interesting stories: He is best known for a play in Game Three of the 1975 World Series, where he collided with Red Sox catcher Carlton Fisk on a bunt attempt in the tenth inning in a game the Red Sox would go on to lose. The umpires ruled that Armbrister did not intend to interfere with Fisk and thus called him safe. The Red Sox and their fans have been whining about it ever since. My memories: He is from before my time, but I remember reading about the controversial bunt play. Where he is now: Since his retirement he has worked in the casino business. He is also a consultant to the Bahamas Ministry of Sport. Recently, he started the Ed Ambrister Baseball League to promote youth baseball in the Bahamas. Google Autocomplete results: He is second when you type Ed Ar, between Ed Arnold, a news anchor in California, and Ed Argenziano, a high school band director in New Jersey. There do not appear to be any other prominent Ed Armbristers. Player Profile: Tony Armas Jr. I have seven cards of Tony Armas Jr. 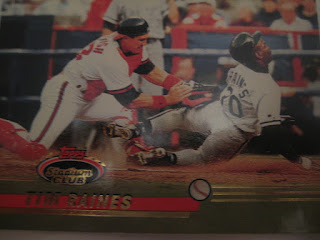 This one is from 2001 Bowman Heritage. 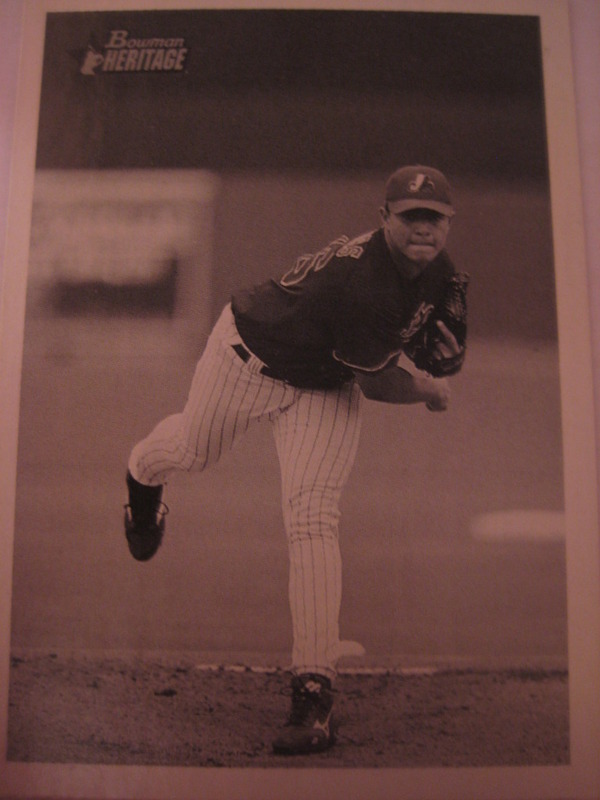 Playing career: Tony Armas Jr. pitched ten seasons in the major leagues, mostly for the Expos/Nationals, going 53-65. He led the National League in wild pitches in 2002. My memories: I had such distinct memories of the slugging outfielder with that name that it was very hard to picture someone named Tony Armas being a pitcher. Fathers and sons tend to be similar players; not so in the case of the Armases. Where he is now: He lives in Venezuela. You can follow him on Twitter (@tonyarmasjr). I asked him if he has any baseball card stories and he replied “no, not really”. Google Autocomplete results: He is eighth when you type Tony Ar, between Tony Arkin, an actor from the 1980s, and Tony Arts Easy Cleaner Free, referring to a computer registry cleaner. There do not appear to be any other prominent Tony Armas Jrs. Coming up next: The next profile will be Ed Armbrister. I have 39 cards of Tony Armas. This one is from 1989 Score. 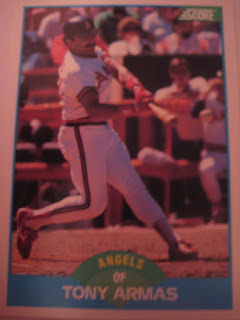 Playing career: Tony Armas played for the Pirates, A’s, Red Sox and Angels from 1976 to 1989, hitting 251 HR. 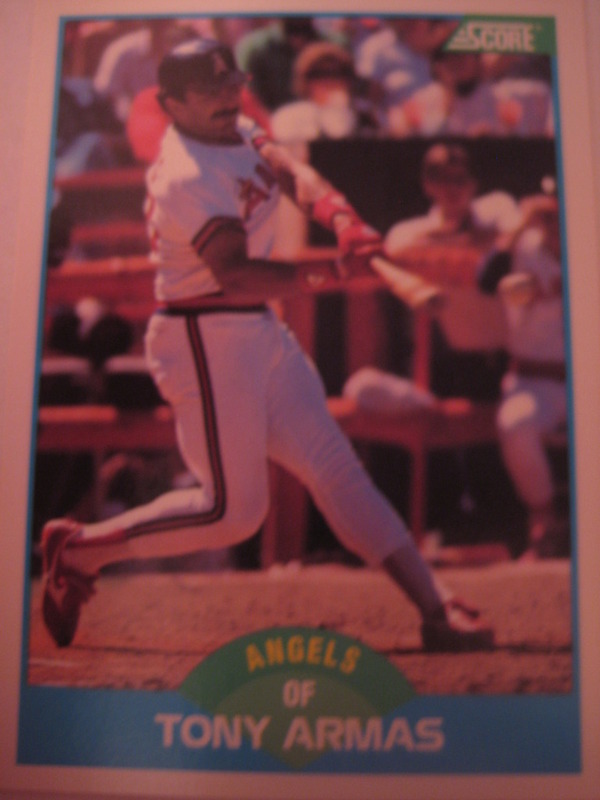 He led the American League in home runs and strikeouts in both 1981 and 1984. My memories: He was winding up his career by the time I started following baseball. No specific memories. Interesting facts: Father of former pitcher Tony Armas Jr.
Where he is now: Hitting coach for the Caracas Leones in Venezuela. Google Autocomplete results: He is fourth when you type Tony Ar, between Tony Arnold, a singer, and Tony Aromando, an Adobe instructor. There do not appear to be any other prominent Tony Armases. Coming up next: The next profile will be Tony Armas Jr. I have one taker on an autographed Frank Robinson card. Still have nine more available! I have five cards of Marcos Armas. This one is from 1991 Line Drive, where his name is misspelled "Marco". Playing career: Marcos Armas played in 15 games for the 1993 A’s, hitting .194 with one home run. Interesting facts: Half-brother of former A’s slugger Tony Armas. My memories: Vaguely remember him as part of the Armas family. Where he is now: Anyone know where Marcos Armas is now? Google Autocomplete results: Marcos Armas does not come up in Google Autocomplete. Another prominent Marcos Armas is a business development manager at Crocsa. Coming up next: The next profile will be Tony Armas.